Add-on to the Wood FindIT Base Cabinet Pullout or enhance an existing drawer, dresser, bathroom or cluttered space with the Ornamental Mouldings Wood Full Tray Organizer. As an add-on to the Base Cabinet Pullout, this tray is an easy to install, functional catch all fitting atop your Base Cabinet Pullout with vertical shelf installed (included). Additionally, the wood Full Tray is the housing component to other add-on accessories such as the wood Full Cutlery Tray, the wood Full Cutting Board and the wood Knife Block. The Full Tray adds maximum style, beauty and durability to your smaller spaces. 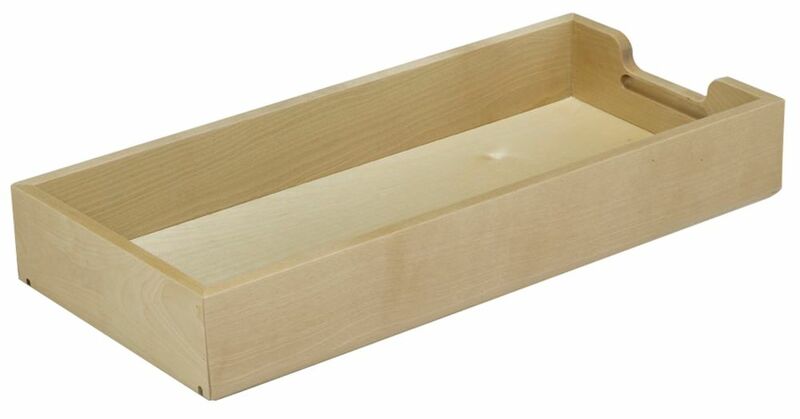 FindIT Wood Full Tray Organizer - 20.8125 Inches x 9.625 Inches x 3.2188 Inches Add-on to the Wood FindIT Base Cabinet Pullout or enhance an existing drawer, dresser, bathroom or cluttered space with the Ornamental Mouldings Wood Full Tray Organizer. As an add-on to the Base Cabinet Pullout, this tray is an easy to install, functional catch all fitting atop your Base Cabinet Pullout with vertical shelf installed (included). Additionally, the wood Full Tray is the housing component to other add-on accessories such as the wood Full Cutlery Tray, the wood Full Cutting Board and the wood Knife Block. The Full Tray adds maximum style, beauty and durability to your smaller spaces.